It’s beginning to look a lot like, well, Thanksgiving right now, but that means Christmas decorating is right around the corner! Curtain tracks- yes, curtain tracks, can change the way you decorate your house for this and every Holiday to come. 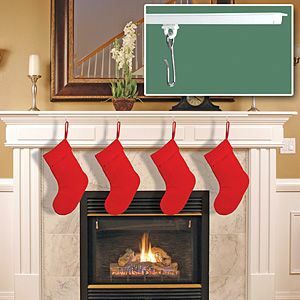 Our customers have found many ways to use extra curtain track around the house for Holiday decorating, but we make it even easier by putting everything you need to outfit your mantle in our Christmas stocking hanger kit. Need more reasons to install this track? We’ve got them: ease and creative flexibility. We should probably name the Christmas stocking hanger kit the “hang any decorations you want any time of year” kit. The track is small and keeps a low profile. Once installed you will keep it up all year, and simply remove the hooks when not in use. Want to hang a banner for a birthday party? Throw the hooks back on with some of our bulldog clips. Use the track to hang fall garlands, decorations for whatever Holidays you celebrate, or just for fun whenever you want. The possibilities are endless and we would love to see what you Pinterest aficionados will come up with. Want more ideas about how to use the Christmas Stocking Hanger kit? Email us at info@curtain-tracks.com.